Sheri Speede, a veterinarian and founder of the Sanaga-Yong Chimpanzee Rescue Center in Cameroon, Africa, unquestioningly understands chimpanzees’ capacity for complex emotions. 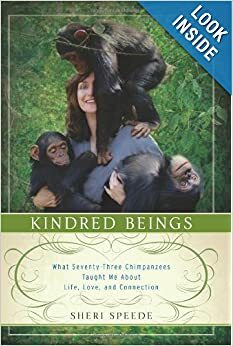 In her new book, Kindred Beings: What Seventy-Three Chimpanzees Taught Me About Life, Love, and Connection (HarperOne; September 2013; Hardcover; $26.99), Speede unveils the story of how she sold her interest in a thriving veterinary practice in the United States to travel across the globe and establish a sanctuary for chimpanzees threatened by habitat loss and the illegal African bush meat trade. Speede’s journey begins when she is called to Cameroon to provide medical care at a wildlife center and, later, a zoo. During these visits, Speede befriends three chimpanzees confined to small cages as tourist attractions at a seaside hotel. Fueled by deep empathy and a fierce sense of injustice about the fate of these kindred souls, Speede forever changes the course of her life when she dedicates herself to saving these and other captive chimps in Cameroon. Navigating geographic, logistic and medical hardships in a cultural landscape completely foreign to her, Speede perseveres in her mission, eventually building an elaborate sanctuary in the forest and taking the chimpanzees back to their natural habitat. Books like Kindred Beings, which bring attention to the complex emotional lives of chimpanzees, can increase concern for their struggle to survive. But while this is a story about chimpanzees, it is also Dr. Speede's story. Major events in her personal life unfold in her story of Africa and run parallel to the development of Sanaga-Yong Chimpanzee Rescue Center. As much as anything this compelling memoir is a testimony to the joy and deep fulfillment that ultimately can come from following ones true passion. Sheri Speede, a doctor of veterinary medicine, collaborated with the Cameroon government to found the Sanaga-Yong Chimpanzee Rescue Center, a forested home for orphans of the illegal ape meat trade. With Edmund Stone, she established In Defense of Animals-Africa (IDA-Africa) as a division of IDA International and as the U.S. base of support for the work in Cameroon. Between 1998 and 2011 she lived in Africa full-time; currently, she divides her time between Africa and Portland, Oregon. This was the type of book that keeps you engaged from beginning to end. As someone who always was intrigued by Dr. Jane Goodall and all she did with the primates that she worked with, I loved reading this and found that the journey that Dr. Speede took was both exciting and touching to the heart. This is the type of book that will motivate and inspire and you get to see the depths of commitment of one person to step in for chimpanzees that truly need her. I loved reading about the sanctuary that she set up and the courage and compassion that she showed through much adversity. The book is a compelling read and I found that as quickly that I began, the book seemed to be done. Through this book the reader is taken on the journey along with Dr. Speede, and along with her you will learn and grow in so many ways to become an even stronger advocate for what Dr. Speede is trying to do. A wonderful book for all readers! FROZEN - New Trailer Now Available! Book Review - Own It! Cookie’s Crumby Pictures - New for PBS! Book Review - Ah Ha! You Can Make a Disney Park Custom Map! Free Iron Man 3 JARVIS App Available Today! Activities Fit For A Princess! Prang Products Takes Creativity to a New Level! Radz is Giving Away An iPad Mini!